Peel Regional Police stopped a driver in Mississauga this weekend, after spotting several slats of wood hanging out of a Nissan Sentra. Driver fined $160 for "insecure load"
You wouldn't want to drive behind this car. 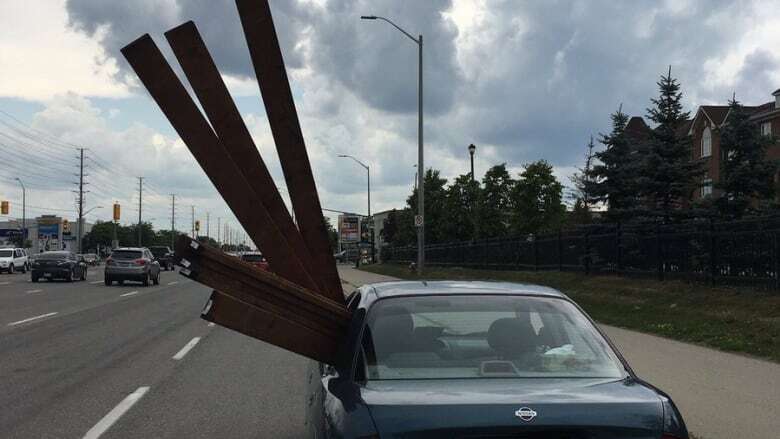 Peel Regional Police stopped a driver in Mississauga on Sunday, after spotting a lot of unsecured wood hanging out the side of a Nissan Sentra. There appears to be around eight pieces of wood sticking out the windows — with nothing holding it down, said media officer Const. Danny Marttini. "You can tell it's just been stuffed into the car," said Marttini. Maybe they were building a deck. Maybe a porch needed repairs. But there was definitely a "fair bit of wood there," she said. Marttini said she's never seen a case like this before. It's more common to see heavy items tied down in the back of a car with the trunk popped open, she said. This was a "whole new way of transporting wood" — and a dangerous way to carry a load, she said. At any moment the wood could shift around, fall out or cause a collision. Anything poking out of your car should have a flag on it to alert other drivers, said Marttini.​ Even a colourful ribbon will do. Failing to do so netted the driver a $160 fine, police said. It may have been cheaper to get delivery.